Dan Miethke began working with fire over 20 years ago, Stephanie Hoeggerl began international performances combining gymnastics and pyrotechnics at the age of 16. Meeting onsite in Shanghai 2008 Stephanie and Dan began to first blend their skills. Touring together as lead performers and supervisors with Vienna’s Phoenix productions across Europe and the Middle East through 2009 & 2010. 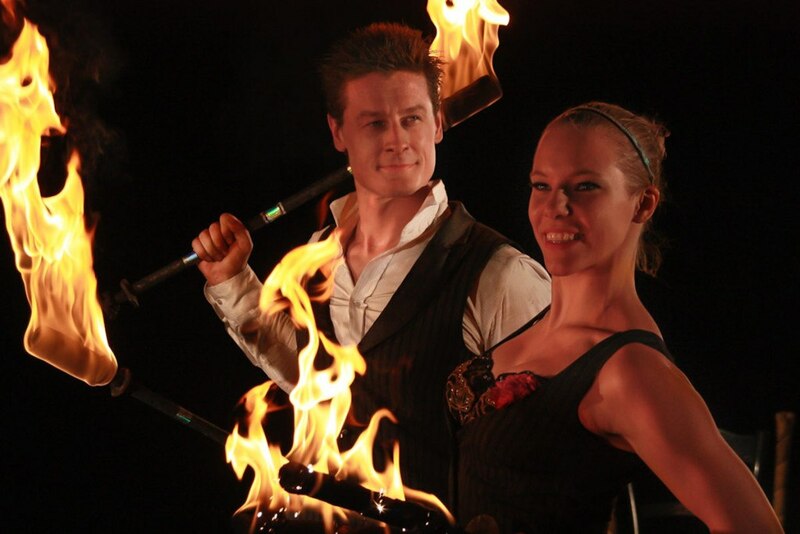 Joining Cirque du Soleil in 2010 on the stage of ‘Zaia’ for 2 years as Lead performer and Fire coach. 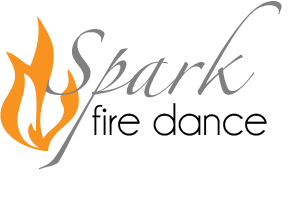 Launching Spark Fire Dance in 2012. Our team has created bespoke performance solutions for companies and productions around the world . 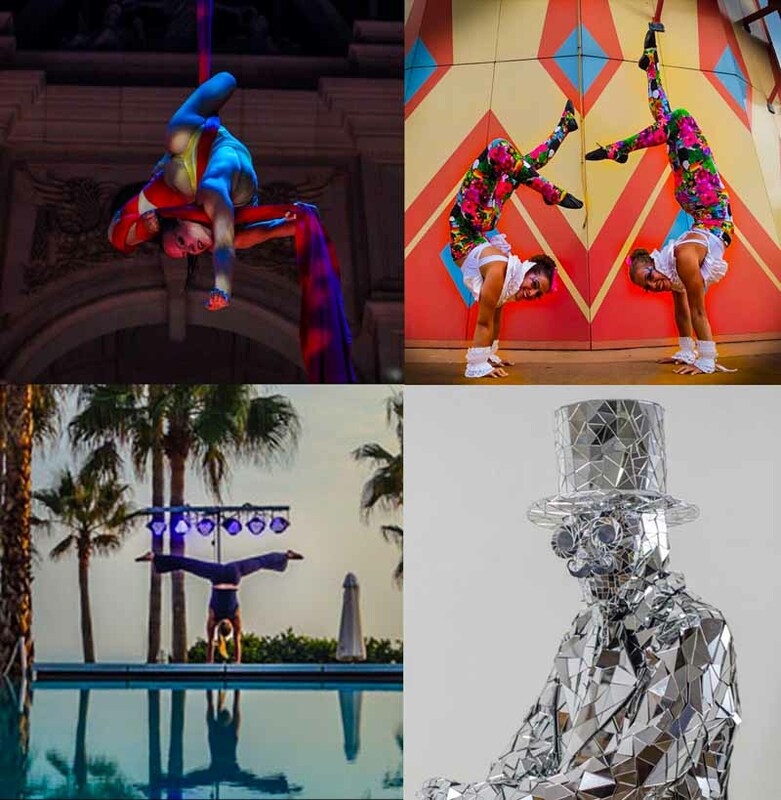 UK event collaborations include Cirque Bijou, Rouge Events and the Historic Royal Palaces. Touring performances with Switzerland’s ‘Art on Ice’ production in Zurich, Lausanne, Davos, Helsinki & Stockholm plus 2 months with ‘Himmel auf Erden’ in Zurich. Dragone contracted Spark Fire in 2014 to supply fire coaches, flame systems and become consultants to the performers and technicians of the Franco Dragone production ‘The Han Show’ onsite in China. 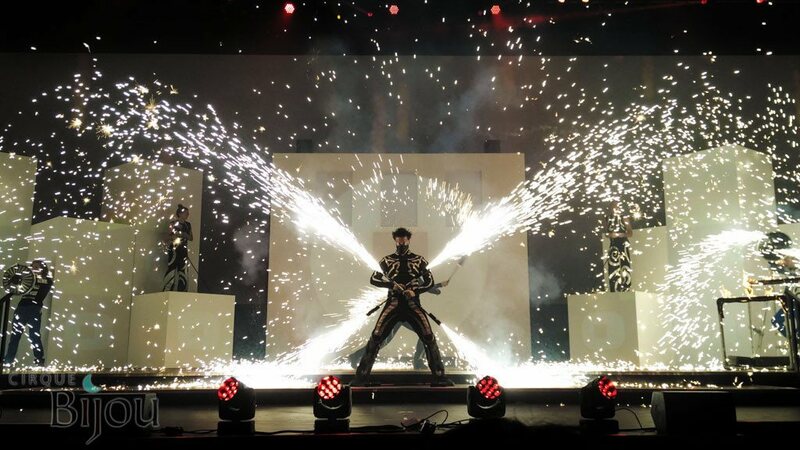 Show creation and direction specialising in live fire and pyrotechnics elements is available. We are able to supply concept sketches, themed soundtrack design and editing plus specialist advice on incorporating our fire and pyro performers into your production or private function. A collaboration with Cirque Bijou to create the finale for their circus shows at the record breaking Minecon 2015 conference for a 10,000 strong audience and millions more via live stream. Blending several remixes from client relevant musicians to produce a fresh and powerful soundtrack, re-editing as concepts changed and ensuring music suitability for children and families. Fresh out of development we were the first in the world to use the Galaxis H-Flame personal flamethrower systems. 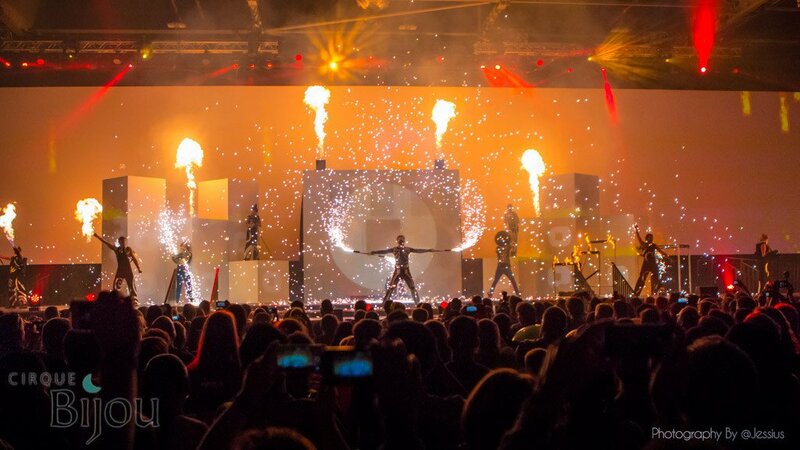 CO2 guns, Fire umbrellas and Cirque Bijou’s signature pyro backpacks, plus our own Dragon Fire systems were all incorporated in this spectacular finale that Vu Bui the COO of Majong, developers of Minecraft described as “mind blowing!”. Providing performance teams and custom multi artist creations commissioned for the Inaugural European Games torch lighting ceremony. Directed by the prestigious Mark Murphy we had the honour to perform on the ancient Ateshgah Fire Temple of Baku, Azerbaijan. President Ilham Aliyev lit the flame from the eternal fires in the temple building as we co-ordinated an effects heavy spectacular for the press and VIP’s. Broadcast worldwide this beautiful ceremony marked the first European Games. 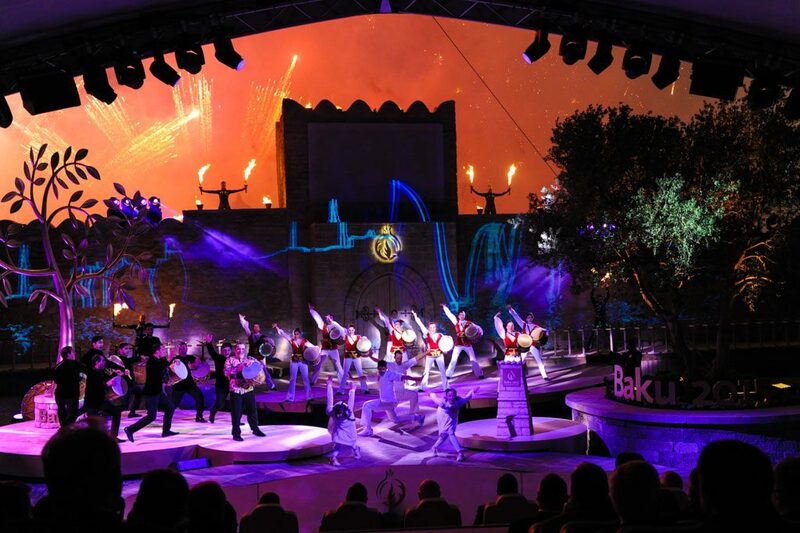 Following the success of this event we were invited back to Baku to perform for the final stage of the Torch Relay as the flame headed into the Olympic stadium for the opening ceremonies. Corporate Parties require special attention. You want to amaze and entertain, but you need to ensure your message and brand communication remains clear. With so many entertainers to choose from how do you decide what to hire? Walkabout, magic, comedy, games, street acts, animals creatures, cabaret. The list can seem endless, but often unfortunately the feeling can be that its all been seen before. 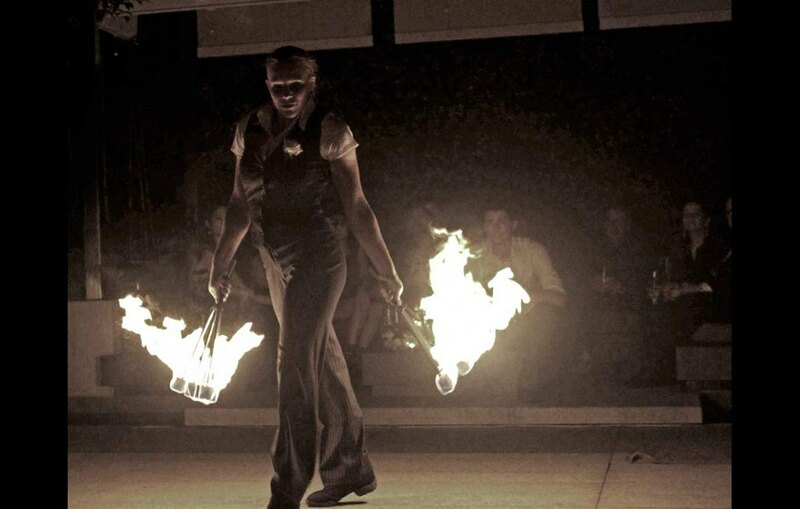 Have two elegant party hostesses greet your guests with handbalance and fire eating, setting the tone of the evening with a display of strength, control and daring. Mirror suit dancers can offer a spectacular walkabout performance. Ground based flame lamps can illuminate this acrobatic art with an ethereal glow and add to the ambiance of the entrance. Fibre optic faerie wands can be used to add a colorful glow to the performers. Softly interacting with the parties guests, this ambient display of physical skill and character is sure to delight. We have other acts and connections with top quality performers in the industry. Let us know what else you need and we can find it. Aerial silks, aerial hoop, handbalance artists, dancers, roving acrobats, LED light shows, belly dancers and more. A range of acts available! Event attendees have often seen tribute bands, painters, drummers, stilt walkers. However most are surprised to see fire indoors. It’s unusual, edgy, powerful and immediately grabs the attention. A 1-2 minute burst of upbeat fire performance can dazzle the guests at the beginning of the night. This teaser, set to an upbeat big band 20’s jazz soundtrack, can be followed after the food and drink by a full feature act as a finale to the nights entertainment. When the desire is to reinforce an existing brand message often a bespoke creation is called on. We discuss clients ideas, themes and requirements in detail, going over the venue, audience demographic and aim of the event. Taking this brief we create a proposal, often with several scalable options, outlining where we see the best potential use of our artists, directors and effects to highlight the desired message. Once we have an agreement on the show direction soundtracks are mixed and edited to suit with previews available for feedback. Artists and crew are cast, rehearsals booked, costumes modified or created from scratch depending on the requirements. We’ll arrive on the day ready to tech and co-ordinate with light and sound techs to ensure optimal visual and auditory impact is achieved. From there on a client can sit back and enjoy the experience. Our team of specialists is expanding but our time is limited and dates book quickly. If you would like to explore our performance options please do contact us early to avoid disappointment.